Environment Secretary Michael Gove has announced a consultation to end the trade in ivory of all ages - previous attempts at a ban would have excluded antique ivory produced before 1947. Conservation groups have given a guarded welcome to the plan. While the UK has had a ban on the trade in raw ivory tusks, it has become the world's leading exporter of legal ivory carvings and antiques in recent years. According to an Environmental Investigation Agency report, there were more than 36,000 items exported from the UK between 2010 and 2015, more than three times that of the next biggest exporter, the US. Conservationists argue that these sales stimulate the demand for the product, and are linked to increased elephant poaching across Africa. Prince William has long been a campaigner against against ivory trade and in 2016 urged the UK to pass a total ban on domestic sales. At a wildlife conference in Vietnam, he said: "Ivory is not something to be desired and when removed from an elephant it is not beautiful. "So, the question is: why are we still trading it? We need governments to send a clear signal that trading in ivory is abhorrent." Previous attempts in the UK by the Conservative Party to limit sales of ivory have failed to get off the ground. A ban on sales of ivory produced after 1947 was announced by then Environment Secretary Andrea Leadsom in 2016 but a follow-up consultation never materialised. However, a 12-week consultation on Mr Gove's proposals is due to start immediately, and draft legislation covering a ban on sales and exports is likely in the new year. The government says that the proposals are being driven by concern for the 20,000 elephants that are killed by poachers every year. "The decline in the elephant population fuelled by poaching for ivory shames our generation," said Mr Gove in a statement. "The need for radical and robust action to protect one of the world's most iconic and treasured species is beyond dispute." He said the proposals will put the "UK front and centre of global efforts to end the insidious trade in ivory". While the government says the plans are driven by concerns over elephants, there are other factors at play. Britain will host a major illegal wildlife conference in 2018 and it would be embarrassing if the UK was continuing to allow a domestic market in ivory while countries like China were moving to close theirs as they have promised to do by the end of this year. "The key thing is, we hope, they will have committed to the ban before this conference," said Heather Sohl from WWF UK. She said it would allow the UK to have a greater standing in how China enforces its own ban and also strengthen its hand in dealing with countries with legal markets. While environmental groups have welcomed the government's new stand, there are concerns over the size and scale of exemptions to the ban. Some conservationists are worried that if these exemptions are too broad, they could become loopholes and undermine attempts at a ban. Others, though, believe that clear and strong restrictions can be put in place. But those involved in the antiques business are not happy about the proposed ban. Noelle McElhatton from the Antiques Trade Gazette said those involved in the trade abhor poaching and are disgusted by what is happening to the African elephant. 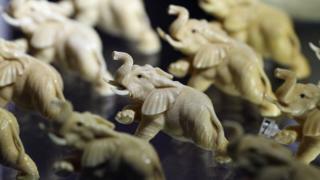 However, she said she expected art and antique sellers to argue that a ban on trade in objects made pre-1947 - which she said could include Georgian chests of drawers, Victorian pianos or Art Deco figures - "will not save a single living elephant". "We feel strongly that an outright ban would be an over-reaction and would be very detrimental to the honest and legitimate trade of pre-1947 ivory." The consultation will run until 29 December.